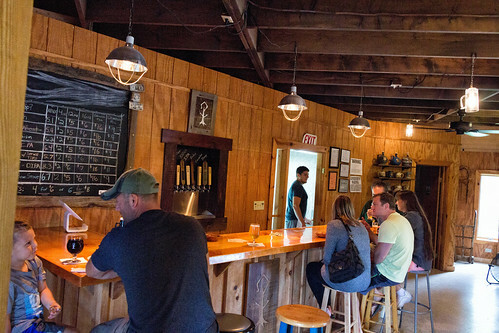 With many breweries and wineries so close to home, we tend to overlook them when choosing a new place to include for this blog. 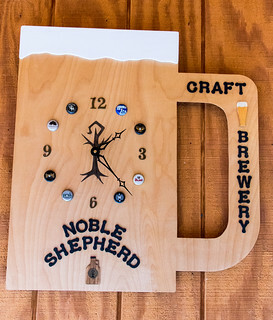 The time was ripe to add one of our most frequented local haunts, Noble Shepherd Craft Brewery in Bristol, NY. Excited to finally have the opportunity to write about this brewery, it has become one of our favorite spots to relax and play a round or two of cards. 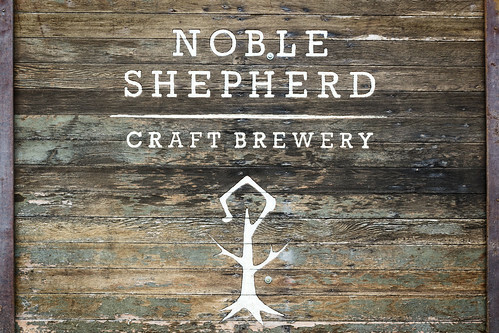 We met up with Tony Moringello, the brewer and co-owner at Noble Shepherd, to discuss the brewery and taste some fine beer. 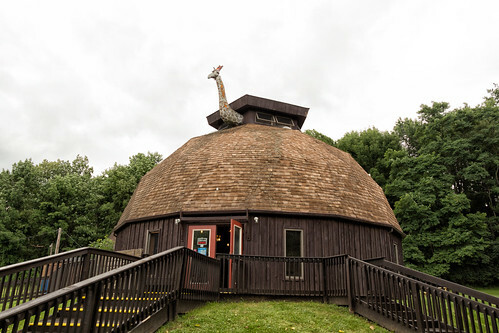 Noble Shepherd is located within a series of interconnecting geodesic domed buildings and shares the same parking lot as The Wizard of Clay pottery studio. The roof of the main building includes an interesting oddity, a bullet-hole ridden sculpture of a giraffe wearing a wizard’s hat. It clearly has seen better days but, from what we learned later, they are not allowed to touch or alter it in any way. 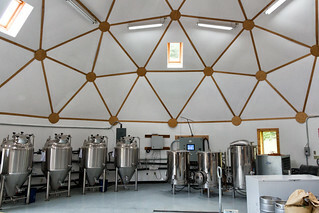 Inside, Tony and his wife Jessica operate the tasting room out of one dome, and the production area out of another. At the bar, Tony ran through a flight with us, discussing the intricacies of each of his creations as well as some further history about the brewery itself. Clean and traditional, deliciously malty. A clean cucumber / pickle aroma mixes well with the Saison notes. Refreshing cucumber taste works wonderfully with the earthy aspects of the Saison. Named after their soon to be second son. Beautiful tropical aroma, nicely balanced, with great fruit flavors. One of their customers hand-picks the spruce tips for them. Packed with Vitamin C, this beer smells just like the Adirondack forest floor. Unique and flavorful, the Belgian notes still hover about in the background. Double IPA named after Buckminster Fuller, the inventor of the geodesic dome. Rich and juicy, this beer is full bodied with plentiful tropical, orange, and citrus notes. The higher ABV is masked very well. Not boozy at all; hops take center stage. Beautiful dark tan head; coffee and chocolate aromas blend nicely. Plenty of vanilla in this batch, with the coffee a bit more reserved but still quite delicious. As long as the brewery is not too busy, Tony likes to take the time to pour each beer separately in a flight. This way he can give more detailed information on the particular style without the other beers warming up too much while waiting to be tasted. I like this method as it is much more personable; a nice touch that some breweries just don’t take the time for. After having visited the brewery numerous times over the past few years, I still have not picked a favorite. Tony’s Saisons are all wonderful, and the unique IPA’s being produced are also delicious and bursting with tropical hop flavor. When the weather gets colder though, I tend to gravitate towards the coffee bourbon stout, which rotates back and forth with the vanilla coffee bean stout in the available line-up. Most popular with customers at the time of our visit was Bucky’s Double, their Double IPA. 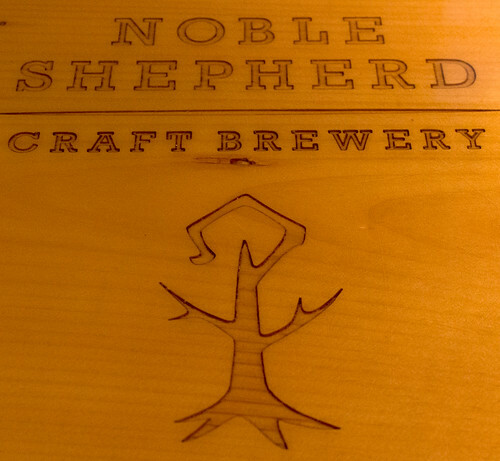 Noble Shepherd opened its doors in November of 2015, but Tony had been home brewing long before then as a buddy got him into the hobby. While working professionally as a chef, he was involved in a fundraising competition and needed to create a dish representing France. Tony included his Champagne Saison, which became the hit of the competition. Many people started requesting the beer and the seed to open his own brewery took root in his head. Coming up with an appropriate name for the brewery was the next step for Tony and Jessica. 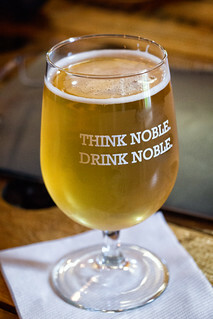 Since his Champagne Saison was partially inspired by one of their favorite beers, Noble Rot from Dog Fish Head Brewing Company, they wanted to use the word Noble. They also lived on Shepherd Street, the location where they discovered their faith. Their faith and spirituality truly inspired them to make this giant leap and open Noble Shepherd. Finding a location for the brewery turned out to be a bit more difficult. Originally they wanted to be on one of the Finger Lakes but the cost was just too high. Searching around Rochester was proving fruitless as well. Finally, one of their friends let them know that Wizard of Clay was just using some of its buildings for storage. Tony and Jessica made arrangements to visit the location and Tony’s first thought upon seeing the exterior of the building was “absolutely not!” He had no intention of putting a brewery in a place that looked like “two coconuts with a giraffe sticking out of the roof.” Jessica said they really should consider it; so he prayed for a sign and fortuitously they spotted a plaque with scripture from the bible right near the exit. This convinced Tony that they needed to at least give it a try and, almost three years later, business is going stronger than ever. Tony is currently brewing on a three barrel system but wants to eventually expand a bit with a few more tanks. If he does that, he would consider moving to another location but still stay in the same general area as the lake community brings in a steady stream of patrons all throughout the year. While he doesn’t have a bottling or canning line right now, the beer can also be purchased at Inspire Moore Winery. 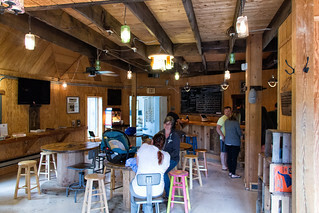 Tony does not have a NY farm license, yet chooses to source many of his ingredients locally. Hops mostly come from Brown Dog Hopyard and Crooked Creek Hops Farm. 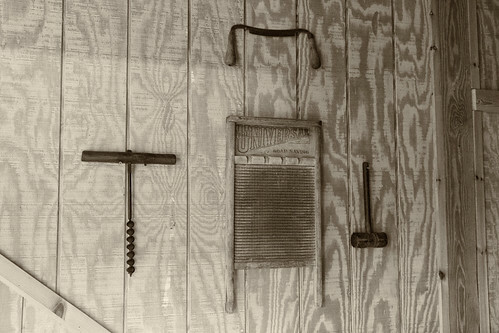 Much of the malt is purchased from a malt house in Bloomfield. Coffee for the porter is acquired from one of my favorite local coffee roasters, Joe Bean Coffee in Rochester. Tony sends his spent grain to Firestone Farms in Livonia. If it were up to Tony, all the beer he produces would be hop forward Pale Ales and IPA’s. He loves working with these styles and wants to showcase the variety of hops that are available without making super bitter beers. One of the first beverages that got him interested in craft beer was Sierra Nevada’s Pale Ale, however he is more heavily influenced by Dog Fish Head and their unique diversity of recipes. Like them, Tony is not afraid to try something new if he thinks it might turn out interesting. While he is not a fan of styles such as Scotch Ales and maltier IPAs, he will brew them for the customers as there has been a big request for them. Opening a brewery has not been easy for Tony and Jessica. After the first six to seven months, Tony had to leave his full time job and devote all of his energy to Noble Shepherd in order to keep his sanity. 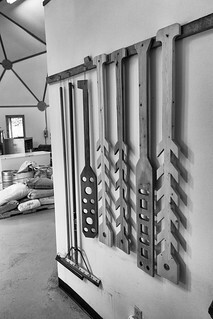 Their families helped to get the brewery constructed, including the beautiful wooden bar. It has been worth it though, as the fruits of their labor show in the faces of the happy customers. 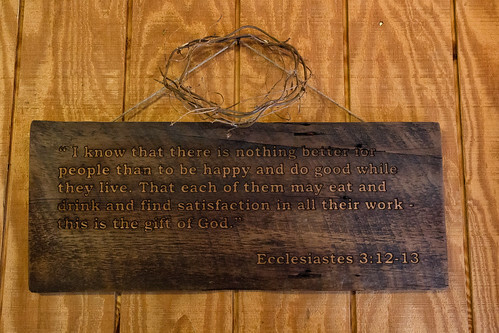 I can’t help but smile every time I step into Noble Shepherd. It has such a relaxed laid back atmosphere, and the variety of local people and tourists that come through the door are truly fascinating. I love the tables made from old wire spools used by Geneva Electric, as well as the lights made from upside down pitchers, mason jars, and beer bottles. Complimentary popcorn and pretzels are always available, with live music and food trucks coming through on the weekends. The brewery even schedules a few “Paint with Pints” and open mic nights. Folks are more than welcome to bring their dogs with them as well. 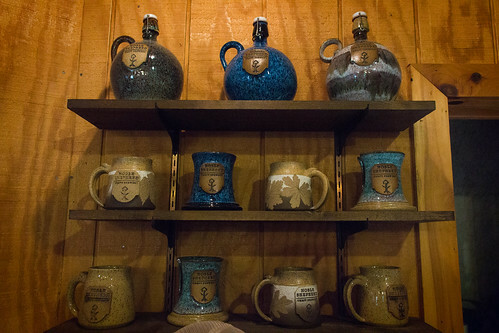 Beautiful handmade clay mugs and growlers produced next door at the Wizard of Clay are also available to purchase. 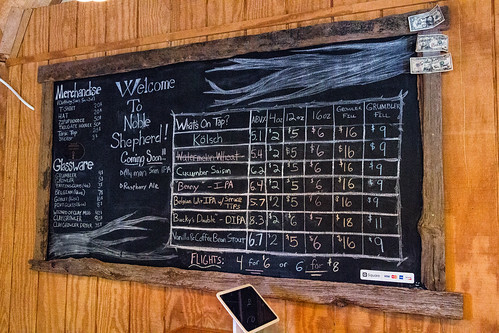 Noble Shepherd Craft Brewery is a worthwhile place to spend some time if you are visiting the Finger Lakes area and want to taste some great beer. Tony and Jessica have created something special and I can’t wait to see where they go from here. I wish them success in all future endeavors and am already looking forward to returning to try the latest creations. 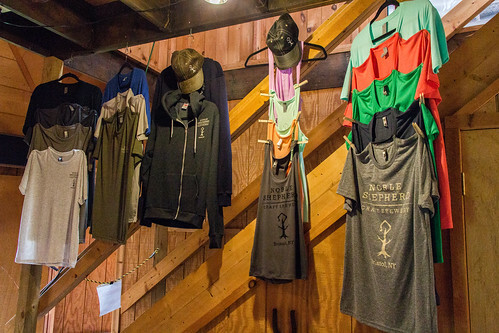 Noble Shepherd is located just up the road from Honeoye Lake. Named after a Seneca word that translates roughly to “where the finger lies,” Honeoye is the second smallest Finger Lake. The shores are lined mostly with recreational homes, and the fishing here is said to be exceptional. Be sure to stop by Labor Day weekend, when the residents light flares around the lake to celebrate their annual Ring of Fire event.